Gerry Carr of Canonical made the announcement on the Canonical Blog yesterday stating, "It’s with some regret that we are announcing the end of the ShipIt Programme and the CD distributor programme." Carr notes that Canonical has shipped millions of free CDs throughout the years to millions of people in every country in the world. 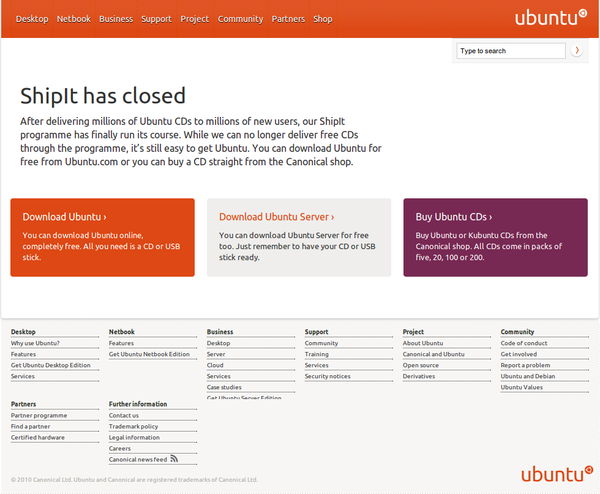 However, over the last two years Canonical began to limit the number of CDs per person and the number of times a person could apply for a CD and as of Ubuntu 11.04 individuals will no longer be able to go to the website and apply for a free CD. Following Carr's post, Jono Bacon, Ubuntu Community Manager, posted ShipIt Discontinued, Long Live LoCo Teams. In this post Bacon answers questions such as, "Why? ", "What about LoCo Teams? ", "How do LoCo Teams get CDs? "and "Why can only approved LoCo teams get CDs?". In summary, approved LoCo teams can still get CDs shipped to them. Comments on Bacon's post reflect disappointment for some, but for the most part the community seems understanding.